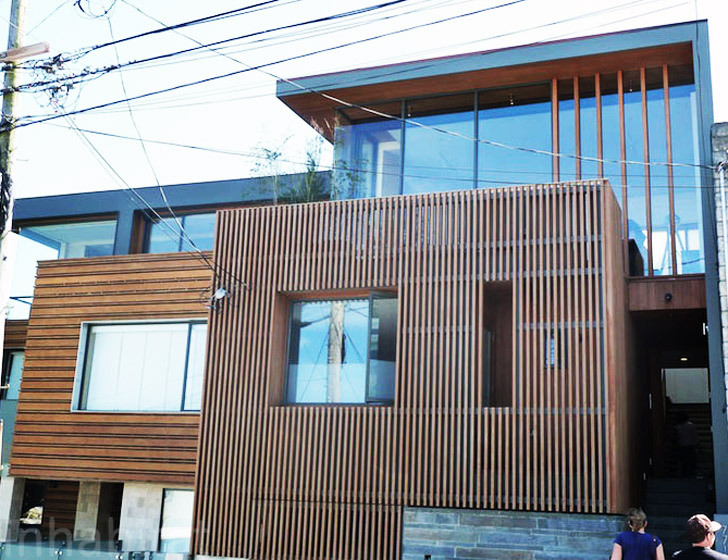 The American Institute of Architects (AIA) hosted its 9th annual San Francisco Living: Home Tours as part of the Architecture and the City Festival , and Inhabitat was on the scene to bring you an inside look at this year's stunning modern homes. One of our favorite projects was this modern renovation by Kennerly Architecture and Planning which stretched a modest four room row house into a spacious family home with the best view on the block. The theme of this year’s Architecture and the City Festival was “Architecture of Consequence”, and each home on the tour demonstrated how progressive design and creative problem solving can address society’s current challenges and lead to a more sustainable future. The concept for this grand scale remodel was inspired by a ship in a bottle. In an unusual move, the owners opted to frame the original structure with cedar pickets. The pickets integrate the front facade of the original house and garage with the additional living space above. A staircase, set back from the street draws you in to the remodel, which retains the home’s original frame and foundation. 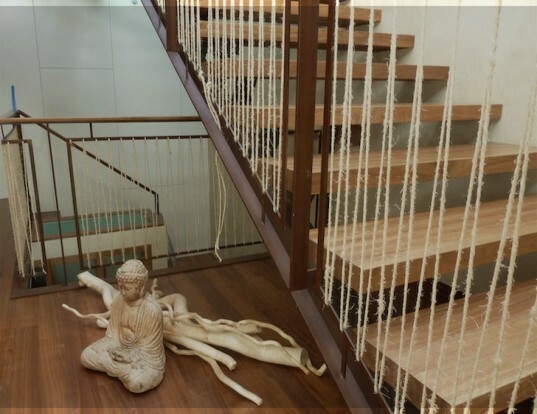 A hemp rope balustrade on the staircases carries the nautical theme throughout. Cedar, rope, and teal blue tile are some of the materials chosen for cohesive and ocean-reminiscent elegance. Skylights draw sunshine into the center of the house, and glass walls open the entertainment area up to a panoramic view and garden. A multipurpose study and gym with a deck overlooks the rooftop recreation area complete with cedar plank walkway. A cedar wood sauna in the floor-level master suite is one indication of the detail and craftsmanship involved in the completion of this project. A solar paneled roof, daylighting and old-fashioned preservation play a role in the sustainable architecture of the building. The owners also sprung for ultra-efficient LEDs for ambient cove lighting, uplighting, and bathroom lights. Low voltage halogen bulbs cover the rest of the house. The backyard holds what is arguably the most fun design feature: a large rectangular trampoline overlooking Noe and beyond. For more photos of this Noe Vista and other 2011 AIA Home Tour picks, take a look at Inhabitat’s Flickr. The concept for this grand scale remodel was inspired by a ship in a bottle. In an unusual move, the owners opted to frame the original structure with cedar pickets. The pickets integrate the front facade of the original house and garage with the additional living space above. A hemp rope balustrade on the staircases carries the nautical theme throughout. Cedar, rope, and teal blue tile are some of the materials chosen for cohesive and ocean-reminiscent elegance. Skylights draw sunshine into the center of the house, and glass walls open the entertainment area up to a panoramic view and garden. A multipurpose study and gym with a deck overlooks the rooftop recreation area complete with cedar plank walkway. A cedar wood sauna in the floor-level master suite is another jealousy-inducing luxury addition. 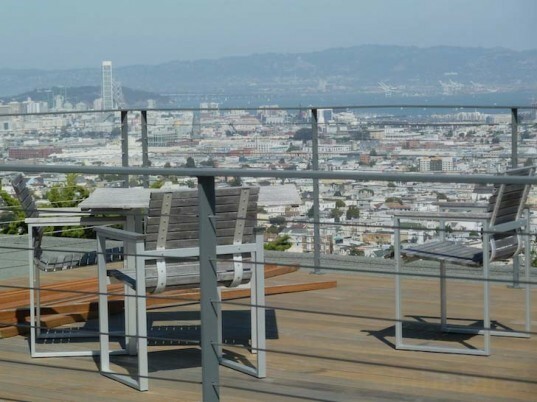 Daylighting and old-fashioned preservation play a role in the sustainable architecture of this big building, but the backyard holds what is arguably the most fun design feature: a large rectangular trampoline overlooking Noe and beyond. The two-story addition means a rooftop deck is raised well above its neighbors and offers 360 degree view of the valley. Solar paneled roof, daylighting and old fashioned preservation play a role in the sustainable architecture of the building. Overlapping shapes and angles add to the drama of this eco-conscious redesign. Modern stacked kitchen appliances reflect and spread light from the opposing glass wall. The owners also sprung ultra-efficient LEDs for ambient cove lighting, uplighting, and bathroom lights. Low voltage halogen bulbs cover the rest of the house. Skylights are seismically retrofitted with stainless steel rods. A row of flowers benefit from the natural light and bring charm and warmth to the light wood surroundings. For more photos of this Noe Vista and other 2011 AIA Home Tour picks, take a look at Inhabitat on Flickr.